Many shoppers have questions about our distinctive furniture. We hope to answer some of your questions here but would enjoy hearing from you with questions or comments. What does a coffee table cost to ship and can my floor support the weight? A standard coffee table weighs no more than 150 lbs. Yes your floor can support the weight without needing to be reinforced. Shipping a table is between $120 to $350 depending on the size. For larger custom tables we are able to supply you with the shipping total before it leaves. Prices vary because each piece of furniture is one-of-a-kind and handcrafted. Some frames have more fabrication than others, swivel chairs are more expensive than a non-swivel chair. A low chair weighs about 180 lbs whereas a bistro chair weighs around 150 lbs and a table runs about 120 lbs. Why should I buy stone furniture? It’s not going to blow away. That’s a great question! We have been shipping our stone furniture products for over 12 years, all over the country and into Canada. Everything comes completely assembled! That’s a huge bonus as there are no instructions to read or parts to get lost. We put the furniture on a pallet then stabilize it on the pallet with wood. Then, we cover it with some shrink wrap and it’s ready to go! Everything is shipped via FedEx freight or a broker using our deep discounts. When it arrives to your location, we order what is called a lift gate. This is used to take the pallet off the truck and lower it to the ground. From that point, all you need to do is use a crowbar to pry off the boards. Once that is done, we recommend using a dolly or two people can move the furniture. It’s best to move the chairs by grabbing them on the steel frame just below the arm rocks and support the back with your other hand. The other option is to buy some beer and pizza and invite your friends over to help you move it. Or Labor Ready is also another option, a couple guys can move the chairs together. We don’t recommend lifting the chairs by the arm rocks. They are on there good, but its kind of like lifting your car by the side mirrors. The chairs weigh approximately 200 lbs. The beauty of stone furniture is that you set it where you want it and you never have to move it again. Your furniture can stay outside all year round. NO, that’s the beauty of owning stone furniture, it is maintenance free. How do I know where to place my stone furniture? 1) Location, pick an area that you enjoy and want to spend a lot of time. Or choose an area that you want something, but you don’t want to worry about if it. For example, by a lake, along a trail or off the beaten path. 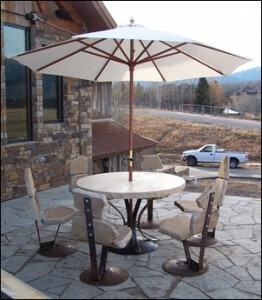 Stone furniture can go anywhere, even mountain tops with with amazing views! 2) The view, Be sure you put it somewhere you enjoy, stone furniture is heavy and you don’t want to move it very often. 3) Weather, the sun and wind play a lot into placing stone furniture. If this is an area that you will spend more time during the early morning hours, then you will probably want your furniture facing east to warm it. If you are going to be out there at high noon think about having shade to keep you from getting too hot. You can put your seating under a tree or have an umbrella in a stand that is readily available to pop open. In the evening hours stone furniture will retain heat and dissipate it after the sun has set. This is a great feature, and sitting in chairs that have warmed from the sun is a beautiful way to settle into star gazing. 4) Stone furniture is perfectly fine to set on a deck. The main thing to remember is that you will probably have a railing in your line of vision and will probably want to go with a bar set. A bar set will put you up over the railing and give you a better view. 5) Open setting, the beauty of stone furniture is that you can set it anywhere, this includes in the boonies. It can be set in a forest, under a tree, by a pond, on top of a mountain, on a trial, basically anywhere! It does not require any maintenance, its not going to blow away and it will always be there. 6) Swivel or not to Swivel, There are many times when swivel chairs are a must. When sitting in an area that you want to enjoy 360 degree views, its worth investing in swivel chairs. Also great to have swivel stools at a bar or in a small space. 7) Placing next to a pool, the first piece of furniture that comes to mind is the chaise lounge, perfect to lay in and take a nap or read a book. Or use our Deep Seating chairs and add an ottoman to it for an amazingly comfortable and easy to get in and out of chaise lounger feel. To enjoy snacks and drinks by the pool, use a dining table with chairs. 8) In the garden, place a bench in your garden for enhancement and relaxing. A bench under a tree is nice or put 2 back to back under a tree to enjoy views in all directions. 9) Public Areas, at the office or in a public location a bench works great because we build them to be secured to the ground, they also accommodate several people at one time. The solid picnic tables are great in the yard at the office, the average weight on a set with 4 stools is 2400 lbs. These sets are not going to disappear. 10) Fire Pit, Deep Seating stone chairs are best around a fire pit, they always look great, flame retardant furniture and you never have to mess with them. They are sloped back for a comfortable relaxed seating. 11) Your favorite spot, the Deep Seating in Stone works everywhere, you can add an ottoman to kick your feet up to read and relax. Visit our Furniture Gallery to learn more about the styles and materials we use.